I don't know how they'll be able to fit all these characters in 4 issues. Angel: Hey, Giles, you're old again! Giles: Long story, that. Anyway, you say there's attack from the future? Lol, but I need the deets It's too important to happen off screen. I'm afraid you'll have to buy the upcoming Giles miniseries for that. On sale December 2018! 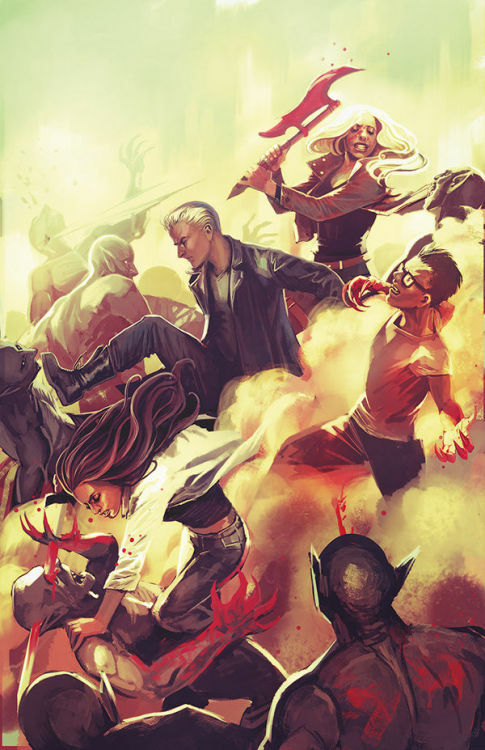 Interesting that there are different selections of people fighting with Buffy which could mean different Buffys or just a different artist's take on a battle showing different players because they didn't want to try and do one overall cover. The outfits are all noticeably different, but again, that could just be different artistic choices. I see that appears to be what the sketch we'd seen of Spike was for and I like their cover fighting together, even though I prefer the style of the third. I assume that is Faith with them. I think it's probably a pick your flavor thing. Spike/Faith/Buffy or Angel/Buffy/Illyria or Fray/Willow/Buffy. They seem a bit more violent than most covers. #1 Spike looks decidedly uninterested. #3 Angel, with his broken sword, looks almost sacrificial. # 2 Sorry...they look like angry Funko Pops - big heads/small bodies. # 2 Sorry...they look like angry Funko Pops - big heads/small bodies. Yeah, I mean what is it with Jeanty and bodily proportions anyway? I find it so off putting. I'm quite concerned about their centre of gravity. I imagine the greatest threat to them is toppling over! Is this Faith in the first cover? Why is Spike fighting with his eyes closed? TBH, I think there's something "off" in all of them. With the exception of Han's Buffy (and all of Jeanty's characters) the white hats seem a bit expressionless compared to Harth and the demons. In Han's, Faith also appears to be asleep. Awesome covers, I like all of them! There's one with Angel, one with Spike and one with Willow (and others) so everybody's happy! Fan service, yay! And hey, check out that Olvikan demon. Is that the resurrected Mayor or something? Olvikan is an old one so it cannot be truly killed. Interesting. The scythe looks really short too in all of them, but especially the first one. The artists just can't seem to get the size of that thing right. It often gets shorter or longer depending on the panel, sometimes it's almost hatchet-sized, sometimes it looks like a small halberd - in the same issue! It's weird because there's a physical prop and lots of shots from the show with Buffy holding it and whatnot that can be used as a reference. I don't know, maybe it's difficult for some reason or maybe the composition of a particular panel is just more important than the accuracy. Last edited by a thing of evil; 16-05-18 at 09:47 AM. 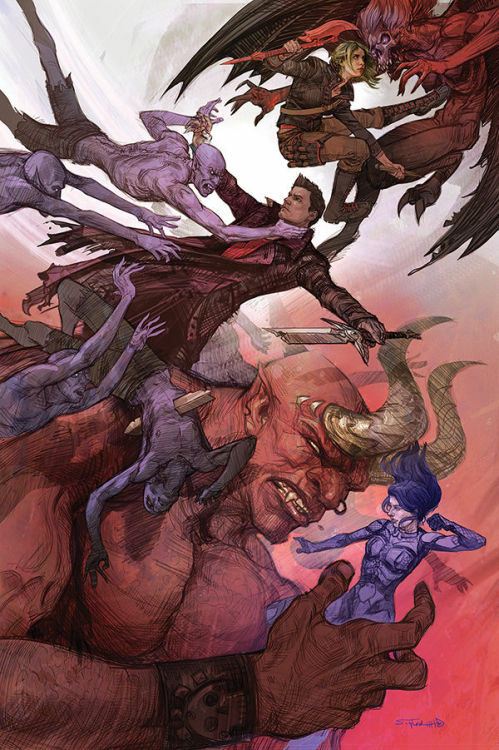 Maybe perspective plays a part as well, because in the Buffy/Angel/Illyria cover, the scythe looks smaller than Angel's sword. I do like that the 'couples' are together, but this sort of fan service does not bode well for the story. I'm still thinking there will be different timelines to keep all the fan factions happy. Are the couples "couples"? Each cover has a triad - a third term. Could Faith "intrude" between Buffy/Spike (Dirty Girls). Could Frillyria do the same with Buffy/Angel? (A11) What of Fray/Buffy/Willow? There are a lot of Fuffy fans out there But it's a very good point TriBel, the three's are interesting. Hasn't Frillyria already intruded between Buffy/Angel, and we've already seen the jealousy/competition between Buffy, Faith and Buffy's boyfriends. 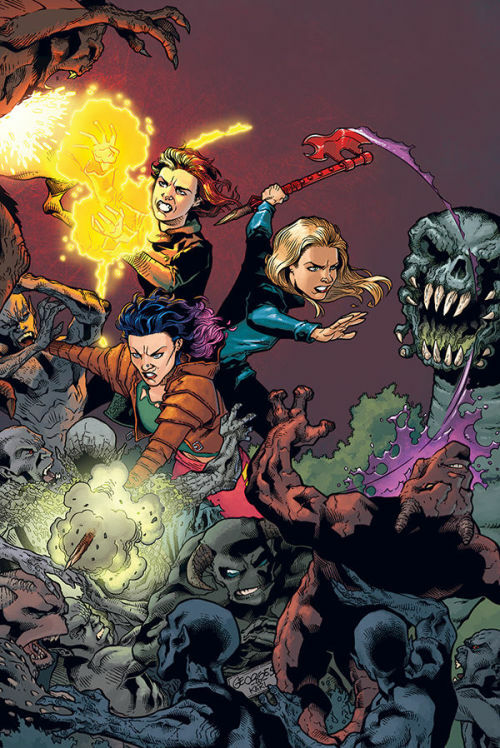 Willow/Fray/Buffy is the real powerhouse trio and I imagine it's something these three do that rescues the future somehow, but I have no idea how it's going to play out. Hmm...And there are some people who'll hate it. Is it evil if .0001% of me is willing to send Spuffy to the wall for the satisfaction Fuffy would bring me? Total vindictiveness on my part aside (that would be WRONG), what if something similar happens with the second triad - that something one of them does (looking at Willow) is responsible for the break between the others (ie. between Buffy - the present - and Fray - the future). Please note - the above thoughts are a break from work - permissible on H&S grounds. Sometimes you are callous and strange You wouldn't send Spuffy to the wall for Fuffy . . . for Goux maybe, but not Fuffy. Or is it Riles? I think I prefer Goux, pronounced Goo, which is a sticky mix of all sorts of stuff.